The L620® orthotics are engineered to provide optimal support and cushioning while fitting comfortably in most footwear styles. These innovative orthotics feature a strategically placed arch support that helps balance your feet and biomechanically align your body to prevent common foot conditions such as Plantar Fasciitis, Arch Pain and Metatarsalgia. 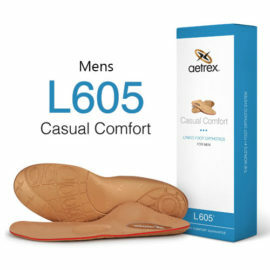 The L605® orthotics are engineered to provide optimal support and cushioning while fitting comfortably in most footwear styles. These innovative orthotics feature a strategically placed arch support that helps balance your feet and biomechanically align your body to prevent common foot conditions such as Plantar Fasciitis, Arch Pain and Metatarsalgia.